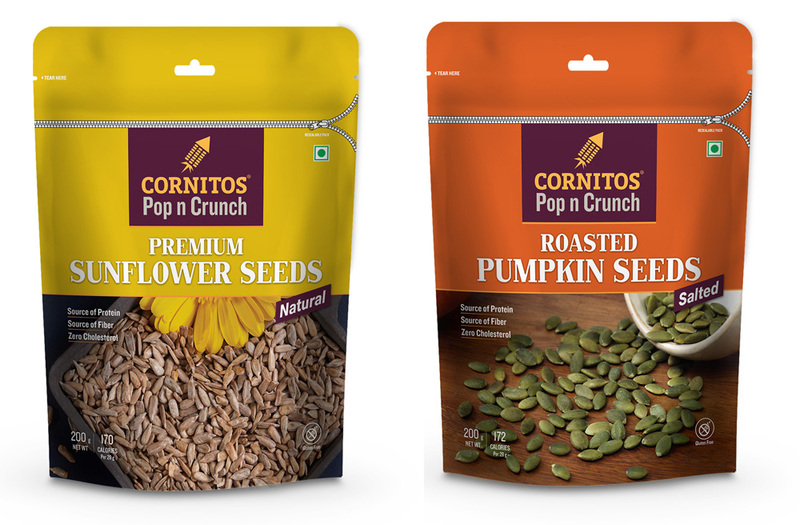 Cornitos, the flagship brand of Greendot health Foods Pvt Ltd expands its Pop N Crunch Range by introducing natural sunflower seeds and roasted pumpkin seeds in 200g Packs. Cornitos Seeds range is inspired by the new age that believes in living an active lifestyle, and aims to make daily snack eating habit, healthy & delicious. Cornitos Natural Premium Sunflower Seeds are guilt free munchies that are rich in Vitamins and Omega-3, perfect for healthy snacking. Cornitos Salted Roasted Pumpkin Seeds are enriched with zinc and magnesium which pack on energy for an active life without compromising on taste for health. These are available in an easy-to-open and Resealable stand up packs of 200g. They lock in freshness and deliver great taste. Its functional design makes it an ideal travel as well as a party pack with goodness of health which provides consumers advantage of multiple time product use instead of one-time snacking. This snack is apt for your exotic morning breakfast, evening snacks and house parties. Availability: It is available in all retail outlets across India. About Cornitos : Cornitos is the largest brand in the Nacho Crisps category in India. Cornitos Brand Portfolio includes Nacho Crisps, Taco Shells, Chunky Salsa Dips, Roasted Premium Nuts – Cashews & Almonds, Coated Green Peas and Pickles – Jalapeno Peppers & Gherkins. Cornitos has an extensive distribution network across Pan India. Complete Range of Products available in Retail, E-Retail and Modern Trade stores. Institutional sales across through Airlines, Horeca, Multiplexes and Cafes. Cornitos products are exported globally, to the USA, Australia, China, Singapore, UAE and South East Asia.